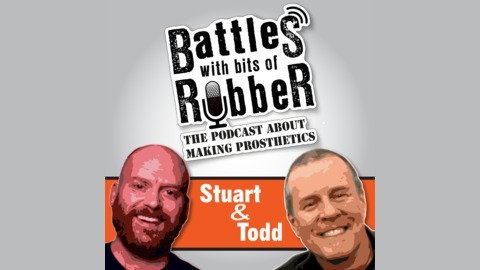 This podcast is a joint venture with Stuart Bray and Todd Debreceni. It's all about the making of stuff for makeup effects and prosthetics. Todd is author of 'Special Makeup Effects For Stage And Screen', what many consider to be the modern makeup FX bible. Stuart Bray is a working makeup FX artist with many years experienc. Credits include 'Saving Private Ryan', 'Shaun of the Dead', 'Dr Who' and more recently 'Game of Thrones'. 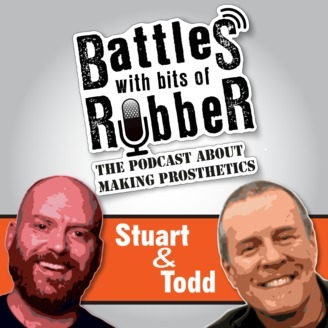 If you have any FX questions you would like to see made into a featured blog post, then get in touch: stuartandtodd@gmail.com. In this podcast we talk about art, what it means to be an artist, why we do it, and the challenges we face in trying to make a living doing this. This was mostly brought about because of the fantastic conversation I had with my first ever boss when I started working in effects in 1994. "From singing sloths to the putrefying corpses of Hollywood A-listers, Animated Extras have been creating all kinds of weird and wonderful things for the Film, TV, and advertising industry since 1986." Pauline was the first person I ever saw take a lump of clay and make it look like a real person when she made a fake head of Michael Gambon for the film 'Mary Reilly'. It was to me complete and total magic, and it was an absolute delight and honour to sit with her and talk frankly about the task of sculpting. We recorded this interview at Animated Extras workshop in Shepperton Studios. Scans v sculpt and the life looks fake but feels real etc. Get the feel early rather than struggle on with wrong and try and make it right. Watching different sculptors work when you run a company. Todd and I get stuck into some deep dives about art, and how it's a joy to have a craft but also a largely unappreciated career path. It doesn't save lives or risk that of the artist by putting them in harm's way. It often serves the artist more than the community around it, and may be seen as a selfish, luxury position and an unnecessary way to spend a life. See what you think and maybe drop us a line at stuartandtodd@gmail.com with your thoughts and experiences about that. I mention a great podcast I listened to by Seth Godin, (the podcast is called 'Akimbo and this was from series 2, episode 9 called 'Distribution and cultural destiny') and in it he talks about how the distribution of media changed the media it distributed. From cinemas, to TV, to Home Vidoe, DVD and now streaming, each new development has reduced costs and democratised the medium. Such access means more making and consumption, but often this can also mean a watering down of quality. Is that a fair trade off or an inevitable side effect? See what you think, I'd reccommend it. Lastly, here is the letter to Agnes De Mille Todd mentioned. We'd appreciate it if you'd share this podcast with friends or colleagues who you think would get a kick out of it.